It's Full Time and the team who will be at the top of this group is Nirmala College. They scored their first goal early in the second half, but soon, Thakur College made a comeback with an equalizer. However, in the dying minutes, Nirmala College rose to the occasion and scored the all-important goal to finish as the group leaders. In the Semi Finals, Nirmala College will play against Guru Hargobind Khalsa College whereas Thakur College will face Shillong College. An eventful and deciding day comes to an end, with just sixteen teams among all the categories are left competing for the big reward. Tomorrow's day will start with the Semi Final of Junior Boys and Senior Boys. Stay tuned and catch all the games Live on our Facebook page and on the website. It's Half Time between Thakur College and Nirmala College and it is still 0-0. Both the teams are trying hard to top the group and with such good teams up against each other, it is never going to be easy for either of them. Stay tuned for more updates on this game. Saint Wilfred PG College ruin SRM Institute of Science and Technology's chances of qualifying for the semi finals by handing them a 4-0 thumping at RCP Ghansoli, and also registered their first win of the campaign by doing so. The final match of the day is between Thakur College and Nirmala College. The winner of this match will be first in their group as both the teams have already qualified for the semi-finals. Watch the game unfold on our Facebook page. Saint Wilfred's Imran Khan struck in the 17th minute to give his team an important lead against SRM Institute of Science and Technology at RCP, Ghansoli. With the two semi-finalists yet to qualify from group B of the College Boys category, the second half of this game is surely going to be a roller coaster ride. Watch the second half action live on our Facebook page. Faith Higher Secondary School make their passage to the RFYS National Championship semi-final by beating Telangana State Sports School 2-0 in Mumbai. SRM Institute of Science and Technology and Saint Wilfred PG College square up in the next match and look for their first win of the campaign. Faith Higher Secondary School were 2-0 up at half-time and their chances of securing a berth in the semis rocketed up. 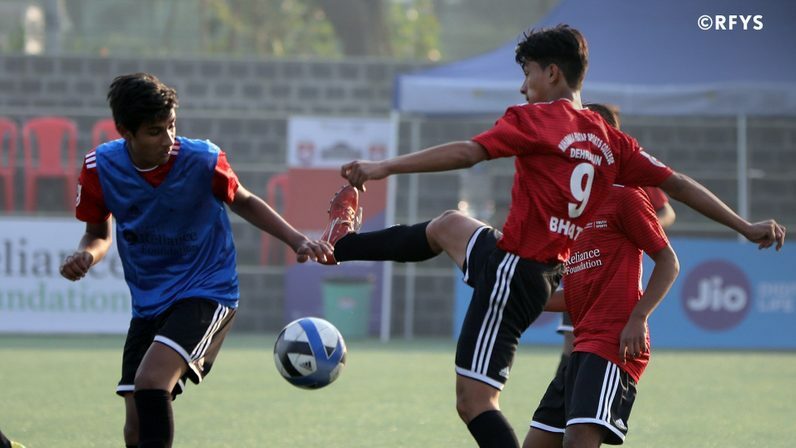 Telangana State Sports School are still looking for their first win of the campaign and they will now have to score at least three goals in the 2nd half to do so. Our Lady of The Rosary HSS struck first and got the lead against Nilamani English School but the latter equalized right before half-time as both the teams headed into the break all square at 1-1. 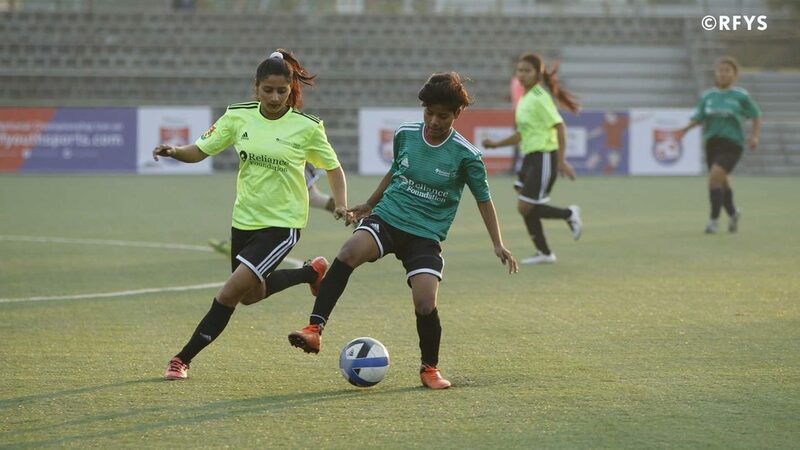 Faith Higher Secondary School take on Telangana State Sports School in the next School Girls fixture in Mumbai. With a comfortable 4-0 win, Guru Hargobind Khalsa College secure a berth in the semis of the College Boys category. Indira College of Commerce and Science will be disappointed at not making it past the group stages of the National Championship. Tune in to our Facebook page to watch the School Girls of Nilamani English School and Our Lady of the Rosary Higher Secondary School battle it out in their last group fixure of the National Championship. Guru Hargobind Khalsa College went into the break with a slender 1-0 lead against Indira College of Commerce and Science in the College Boys fixture in Mumbai. The team from Ludhiana looked threatening throughout the 45 minutes and could've scored more. A first half late goal was not enough to turn the fortunes for City College of Commerce and Business Administration as they went down fighting to Shillong College in their last match of the National Championship. The full time score reading 5-1 in favour of the team from Shillong. Guru Hargobind Khalsa College were ready to take on Indira College of Commerce and Science. Watch the match live on www.rfyouthsports.com. Shillong College score three goals in the first half before City College of Commerce and Business Administration pull one back to end the first half trailing 1-3. An early goal at the start of the second half will make up for an interesting 45 minutes ahead. Watch the match live by visiting www.rfyouthsports.com. Govt. Girls HSS had the major share of possession throughout the game and went on to beat Shri Guru Harkrishan HSS 3-0 and have qualified for the playoffs. College Boys fixture between Shillong College and City College of Commerce and Busines Administration has kicked off. To Watch the game LIVE, click here. Another fixture in the School Girls category is underway between Govt. Girls HSS and Shri Guru Harkrishan HSS. Both teams will be looking for a spot in the semi-final. To Watch all the games LIVE, click here. A crucial match has ended with a dominant Anchalik Jatiya Vidyalaya qualifying for the playoffs with an emphatic 7-0 win over Father Agnel School. Pakhila Boro added three goals to her tally which makes her a top contender for the Golden Boot award. 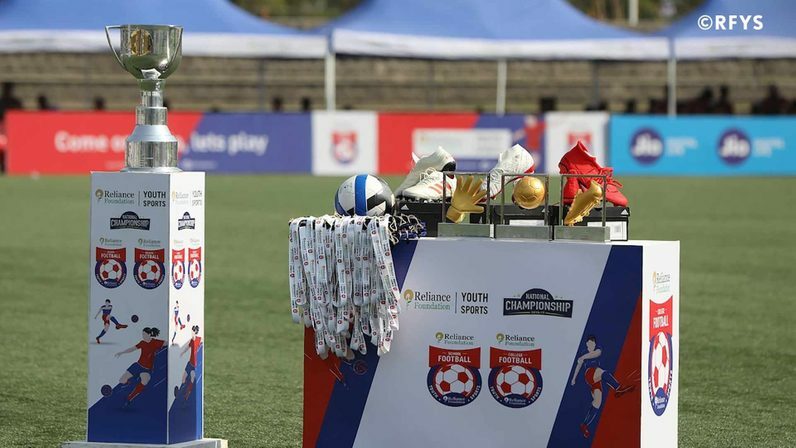 Hello and welcome to Day 6 of RFYS Football National Championship 2018-19. Today we have the last set of league fixtures in the School Girls and College Boys categories in store. Anchalik Jatiya Vidyalaya will square up against Father Agnel School in the first match of the day. To know which teams progressed to the semi-finals in the Junior and Senior Boys categories, visit RFYS National Championship Day 5 Report.